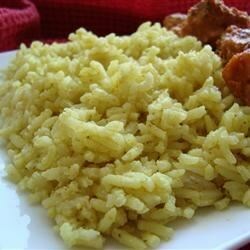 "This delicious, simple coconut rice adds an exotic touch to any meal! Especially great with fish such as salmon." In a medium saucepan, combine rice, onion, coconut milk, water, ginger, curry powder, and salt. Cover, and bring to a boil. Reduce heat, and simmer for 20 to 30 minutes, or until done. My Husband and I enjoyed this very much! We added more water than the recipe called for, found the rice was not cooking quite right! Flavour was EXCELLENT! I added cashews and peas to this recipe and garnished with toasted coconut when it was done.. it was a big hit!